It is with personal regret but warm wishes that J Banks and Co Limited announce the retirement of Christine Evans (Chris). 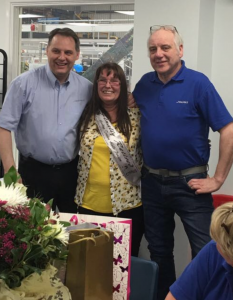 Christine’s retirement from the company has marked the end of an era for J Banks and Co Limited. Chris was very well respected, with her vast knowledge and experience, stretching more than 20 years. She has been a tremendous employee, a real asset to the company contributing to the companies continued success. Christine started with the company 23 years ago with the previous owners, David and Glenys Wellman at their original site in Wood Street, Willenhall and due to the dramatic growth of the business, the company then moved to larger and more modern premises at Tipton. Chris commented that “we were a small but happy band of workers in the early days and I am pleased that this caring and friendly attitude has continued throughout all my time with J Banks, even when moving to the new factory at Featherstone with John, who now runs it”. John Wellman, the current Managing Director, has fond memories of Chris. He related an experience, one particular Sunday morning when a rush order had to be completed, he and Chris worked along side each other, packing house wares, working hard to complete the order on time. John commented “Chris was a real pleasure to work with. Her strong work ethic and her loyalty will not be forgotten. Her retirement is our loss, but a well-deserved rest for her”. All the Management and staff at J Banks and Co Limited would like to wish Chris all the very best for the future.